Decimals are those numbers which have a point (or a comma). And digits after the point (or comma). 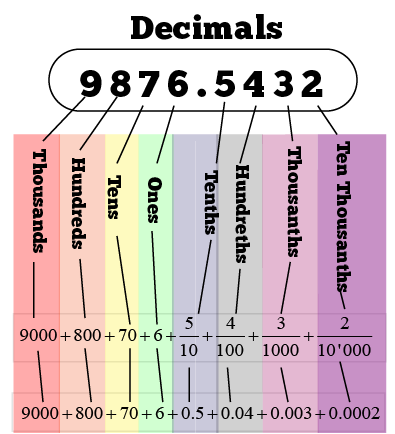 They are so called because we use the "base ten" or "decimal notation" or "denary system" when we count today. The Roman system was not primitive or complicated as some say. Actually it's easier to calculate small numbers like they did! And the Roman numerals were used everywhere in the Roman Empire (which streched from the Adrian wall to Egypt, from North Africa to Romania) and so well used that at first the "new" decimal positional system was despised and objected when introduced in Europe. It took more than 200 year to be accepted by mathematicians! This happened during the Renaissance, around the XV century (with the help of the Gutenberg's invention: the print - 1450). But merchants, kept using the roman numerals for another 100 years, though! It opened a new frontier within the mathematics universe which is still unfathom today : the evidence that more numbers exist than we originally thought of. The person was an Belgian engineer who lived in the XVI-XVII century: Simon Stevin (1548-1620). It all started by the "discovery" of the decimal notation in Europe in the late middleages, by an Italian merchant travelling in the South Mediterranean with his son Leonardo Pisano, in the XII century (but "mathematical" contacts with the two cultures, the European and the "arab" one were much earlier, since the IX century). written without a denominator and with a...point." (page 147). (changes are mine). Easy? Not at all! You are just beginning to understand rational numbers. Not sure what I am talikg about? Let's then explore those strange numbers that you sometimes see on you calculator, like 1,6666666......and never ending. They are called repeating decimals and they have a surprise for you! Check it out!